I received the Preschool is Cool: Counting with Elmo dvd and was asked to give a review (ages ago). "As part of Sesame Street’s new Preschool is Cool set, Counting with Elmo finds Professor Grover as a preschool teacher and Elmo as his helper for today’s counting lesson—in a real preschool! When silly Professor Grover starts to have a little bit of trouble remembering what each number is, he needs Elmo and the class to give him a helping hand. Featuring counting themed songs and stories like “Counting Booth,” and “Abby’s Sparkle Speckle Freckles”, kids will have fun learning with Grover and Elmo and all their Sesame Street friends." - Grover is my favorite... and there was also plenty of Elmo and Abby Cadabby. - There is a nice mix of main story and clips. - The bonus clip (Herry and John John count to 20) is one a remember from when I was little. I love John John. - The dvd is a little long. 55 minutes. - Even though I thought it was long I wish their were more clips. A couple of the clips were too long in my opinion (like the clip about Abby Cadabby losing and finding her 6 freckles.). They could cut that one clip and put in 2 or 3 different shorter clips. - I'd like more music clips personally. We like music clips in our house! Ana's opinion about the dvd? Well, when it was over her response was "Do anober one. Do anober Grober!" So, I guess it wasn't too long for her. And, I guess she shares my love of Grover just a little bit. 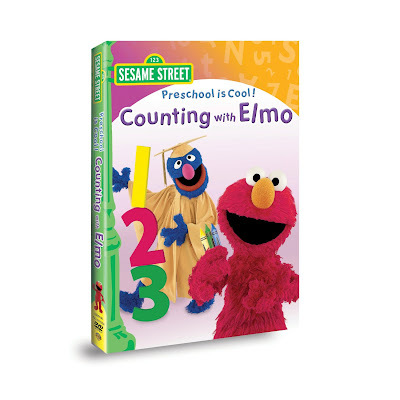 Preschool is Cool: Counting with Elmo is available in stores and online now. I received 2 copies of Preschool is Cool: Counting with Elmo so I have 1 to give away. Giveaway will be open until midnight on Sunday December 26th, 2010.